3 DAYS Left to Enter my GiveAway!!! Comments close at midnight, April 2nd! 4 DAYS Left to Enter my GiveAway!!! Comments close at midnight, April 2nd! The story goes, "if you give a mouse a cookie,....he will want some milk to go with it...." I think this must be the story of my life ;) I've been having so much fun with projects lately, I keep adding more. 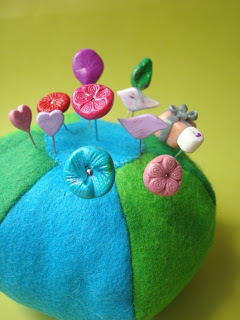 I still don't have a pincushion (maybe I'll get that done later today). But I have some awesome pins to put in it when I get one! 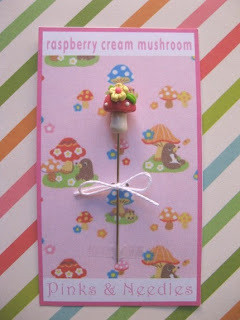 I worked with FIMO soft polymer clay, found at Jo-Ann Fabric stores. It was on sale for 99cents/package/color. I think a clear coat of poly or something similar to make them shine would be nice. The possibilities are endless! I obviously had sweets on the brain when I made these. 5 DAYS Left to Enter my GiveAway!!! Comments close at midnight, April 2nd! Thank you all so much for your sweet birthday wishes! My b-day is very relaxed so far, which is just what I needed after a long week. I finished the quilt top and backing for Titus' coin quilt that I have been making along with Coin Quilt 2009 Flikr group (see link on my sidebar). 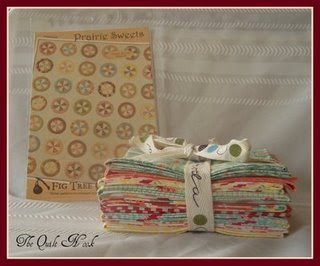 The pattern idea came from one of my favorite quilters, Allison from Cluck Cluck Sew. Before I learned to quilt, she had a very similar design for sale in her etsy store...but I wasn't fast enough to grab it up! She encouraged me to explore quilting, and here I am! Having the time of my life with an age-old artform! LOVE IT! I'm still trying to decide how to quilt it. I'm ready to try free-motion...but I thought a diamond design on point would look great too...any suggestions?? AND...if you haven't yet entered, go HERE for my birthday doll quilt giveaway! Leave a comment about your favorite blanket growing up. Be sure to include your email address. 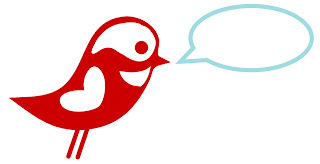 Receive a bonus entry for being a follower of my blog. That's it! Best of Luck! I will announce the winner on April 3rd! I'm up to my eyeballs in projects, but what's one more?? I've put together some fabric choices for a little coin quilt for Titus' wall. I joined the Flikr group "Coin Quilt 2009" and the plan is to quilt along with about 180 other quilters as we make a coin quilt this year. You'll find a link to this Flikr group in my sidebar. Check it out! There are so many beautiful quilts already finished! 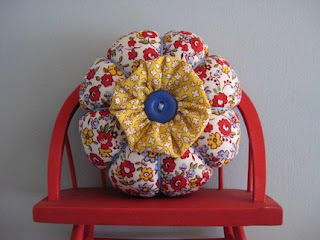 Thankfully, I had a burst of energy to sew and a sweet hubby to watch little T last evening. I finally have the fabric I was waiting on to make my mom's birthday quilt. Well, MOST of it...there is one little 1/2 yard of Alexander Henry's Birdseed in yellow that got lost in the mail. I ordered it on etsy and thankfully, the seller was happy to send another. I'm just still waiting on it to get here. I've been collecting fabrics for a coin quilt for Titus, as well as an extra long quilt for Jeremy. Do you remember the post about camera straps? I've really been having fun making these! They're fairly quick and easy and are great gifts! Here is Mandy Freshour's new camera strap cover in her choice of fabrics....lovely choice, wouldn't you say??? She chose Anna Maria Horner's Good Folks "Small Gathering" in Citrus, as well as "Filigree" in Sun. Her Nikon D40 is going to look HOT HOT HOT!!! And, in case you live in the area and haven't yet taken my advice, go see and feel all the beautiful fabrics at Clementine's Dry Goods on Water Street in Franklin. It's soooooo much more than your typical Jo-Ann's trip! While you're in old Towne Franklin, walk over to Imagination Station. It's a wonderful locally-owned shop, FULL of high-quality toys and such for kiddos. 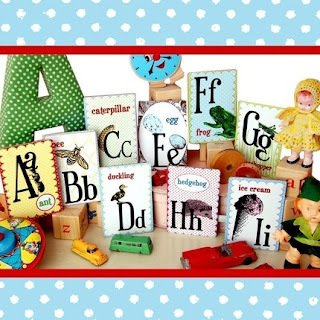 We love Melissa & Doug wooden toys at our house, and today I picked up a wooden mailbox with wooden letters & stamps. I can't wait for Titus to wake up from his nap and try it out! The shoppe is very kiddo-friendly, with lots of toys set up and ready to be touched and played with. No need for a stroller or a kid leash in that store!! ha! They also offer FREE craft time on Tuesdays and Wednesdays! How nice! The weather is BEAUTIFUL! Go outside and absorb some sun today and this weekend. I want to wish a very HAPPY BIRTHDAY to my mommy, who's b-day is Sunday. Remember the quilt I am working on for her? Welllllll, I just received the rest of the fabric I needed today, so it will be a little delayed, however, I'll post pictures as I work on it. I'm so excited to get it going! I'm back from a much-needed mini vacation to North Carolina to visit our good friends before their new baby boy, Brady, arrives on April 4th. The quilt was a success and looks super cute with the black bears and camping theme Heather created for Brady's nursery. While we were there, we celebrated their oldest son's third birthday! Seth is one of my best little buddies and Titus had a fabulous time playing with Seth. For his birthday, Seth asked for a rocket to be painted on his wall. Since I LOVE painting murals, especially when the wall has already been prep'd with the background color, I HAD to paint the coolest rocket for Seth's cool airplane and space-themed room. Here is what we came up with...HAPPY BIRTHDAY, SETH! Hey, friends! If you haven't yet noticed my awesome blog re-design, it's super cool compared to my lame attempt before. My friend, Amanda Freshour worked her graphic design magic and taylored a look to my hobbies and loves! She hit the nail on the head, cause I can't get over how closely it matches the ideas I had in my head, but looks much more trendy! Thanks, Miss Mandy! Enjoy the end of the week! I'm headed off for a mini-vacation with the fam. I'll be back on Monday the 16th... Later, gators! 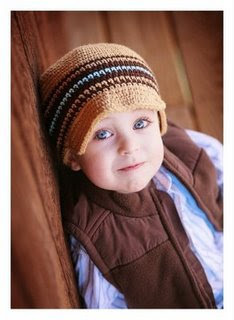 Here is a cute giveaway contest for a sweet little handmade hat by NuxieMade. If you click on the link, it will take you to her site, where you can read the info on how to enter her giveaway. If you have a blog, post the link and get another entry.... These are super trendy and adorable! Don't you love handmade gifts!? I've been brainstorming for awhile some gobbledeegook-type creatures that would make great softie toys for kiddos. My friend, Lynsey was over the other day and it turns out that she has been thinking about making some cuties too. It's always fun to see what others come up with. 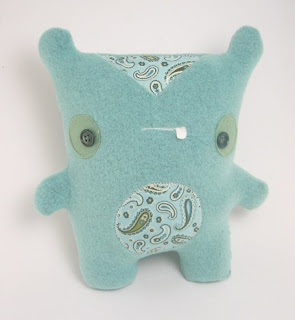 Here is a talented etsy artist who sells some of the cutest little buggers I've seen. Visit Plants and Animals to see more! I like this guy's snaggle tooth. He looks so determined. 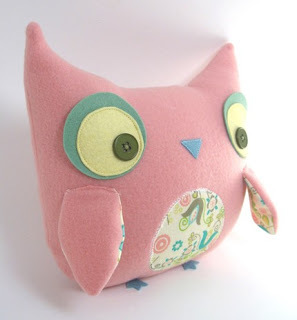 And, of course, owls are all the rage! She's pretty in pink! I like this one for my little niece. 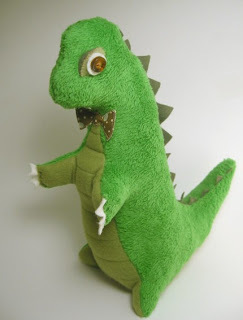 This little monster's name is Hugzilla. Titus would love him! Who wouldn't? He's all business on the front with his bowtie, and party in the back with his dino-spikes! It's okay to want one for me too, isn't it??? 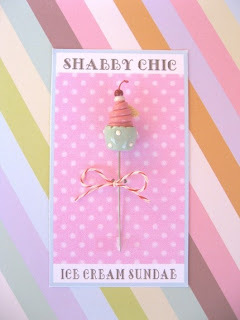 I *heart* Miss Sarah Jane's illustrations, etsy store, and blog BIG TIME! 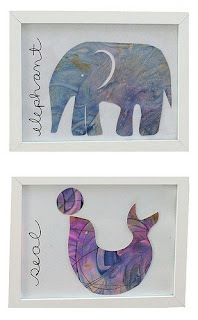 Visit her blog, and she has posted templates for you to cut out your own kiddo's finger-painted masterpieces to create a little wall gallery in the style of Eric Carle. Thanks, Sarah Jane for the darling idea! 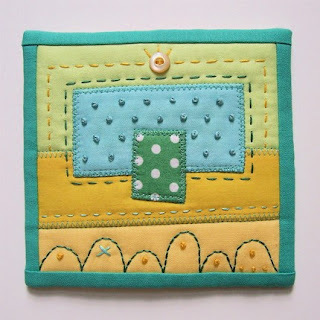 I love it when sewing can be funky and fresh...Visit the sillyboodilly etsy shop for some bright and cheerful quilted art. I purchased a set of these cards from Bibitty on Etsy, just before Christmas. They really make my son's freshly painted room look complete! I LOVE them! You can also find sets of Spanish and French cards too. 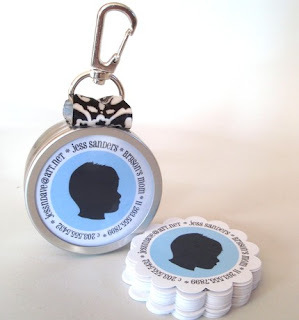 Have you heard that the "cool moms" carry Mommy Calling cards now? I guess it's so you can get in touch with other moms that you may meet at the playground, McDonald's line, what have you. I saw these at PaperRamma and thought they were adorable. They come in a tiny carrying charm that goes on your keychain. What will they think of next? It's surprisingly quiet here as my little guy is sleeping. I'm also watching my friend's little girl today, who is a week younger than Titus. Somehow, I got them both to nap at the same time! So, here is a look at a couple of sewing projects I finished this winter. This little cutie was my first attempt at a softie doll. I made the pattern myself and used up the last of my brain cells as I figured out how to piece her together and attach her arms and legs. She turned out so sweet and she was a great stocking stuffer for my mom. Have you seen those super cute scarfettes that are so popular on Etsy? There was an old cowl- neck sweater in my closet that had shrunk too much for my taste, so I upcycled the cowl into a scarfette. There is a layer of lace added to the top and some vintage buttons from my stash. I also used some grey and evergreen-colored felt to add a little somethin'-somethin'. Hmmm... perhaps it would look better on. What a fun Sunday afternoon of visiting family for my nephew's first birthday. Cake always brings out the best (and sometimes worst) in kiddos! Here is my nephew enjoying some delicious lemon cake...it was GOOOOD! Titus quickly grew tired of the "baby toys" and Uncle Tim let him try out his Canon Digital Rebel...Titus knows that Nikon is the coolest, but he doesn't show favorites when someone actually lets him touch a real SLR!